With a nail salon on almost every corner, it can be difficult to sort the good from the best. Any salon may be able to get the job done, but Nail Talk & Polished Spa, conveniently located mid-island in South Island Square, is raising the bar. 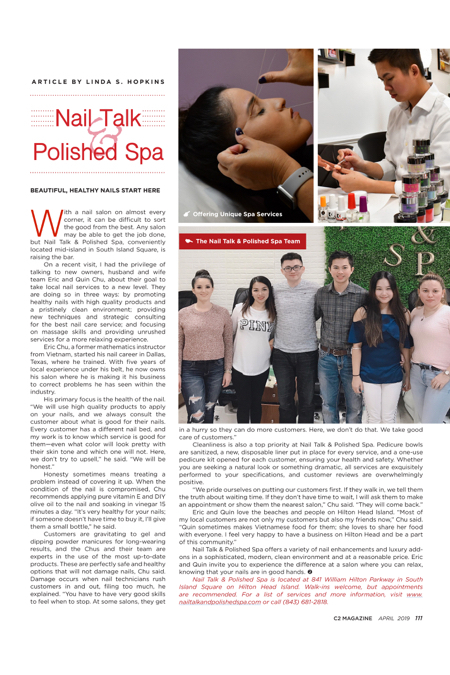 On a recent visit, I had the privilege of talking to new owners, husband and wife team Eric and Quin Chu, about their goal to take local nail services to a new level. They are doing so in three ways: by promoting healthy nails with high quality products and a pristinely clean environment; providing new techniques and strategic consulting for the best nail care service; and focusing on massage skills and providing unrushed services for a more relaxing experience. Eric Chu, a former mathematics instructor from Vietnam, started his nail career in Dallas, Texas, where he trained. With five years of local experience under his belt, he now owns his salon where he is making it his business to correct problems he has seen within the industry. Honesty sometimes means treating a problem instead of covering it up. When the condition of the nail is compromised, Chu recommends applying pure vitamin E and DIY olive oil to the nail and soaking in vinegar 15 minutes a day. “It’s very healthy for your nails; if someone doesn’t have time to buy it, I’ll give them a small bottle,” he said. Cleanliness is also a top priority at Nail Talk & Polished Spa. Pedicure bowls are sanitized, a new, disposable liner put in place for every service, and a one-use pedicure kit opened for each customer, ensuring your health and safety. Whether you are seeking a natural look or something dramatic, all services are exquisitely performed to your specifications, and customer reviews are overwhelmingly positive. Nail Talk & Polished Spa offers a variety of nail enhancements and luxury add-ons in a sophisticated, modern, clean environment and at a reasonable price. Eric and Quin invite you to experience the difference at a salon where you can relax, knowing that your nails are in good hands. Nail Talk & Polished Spa is located at 841 William Hilton Parkway in South Island Square on Hilton Head Island. Walk-ins welcome, but appointments are recommended. For a list of services and more information, visit www.nailtalkandpolishedspa.com or call (843) 681-2818.